Over 100 Legal Aid Lawyers in NYC staged a walkout and die-in outside Brooklyn Criminal Court to protest what they say is a broken criminal justice system. Around 100 New York public defenders staged a walkout at Brooklyn Criminal Court Wednesday, marking five months since Eric Garner died after an NYPD officer placed him in a chokehold. The protest, organized by the Association of Legal Aid Attorneys (ALAA), saw hundreds of lawyers walk out of court as part of the #ThisStopsToday 11 days of action movement for Garner. The #ThisStopsToday movement was in response to the Staten Island grand jury's decision to not indict the officer involved in Garner's death and to call for accountability for other victims of police brutality. The movement, which began on Dec. 10, calls for 11 days of action — one day for each time Garner told police "I can't breathe" while the chokehold was applied. The public defenders were also protesting racism and inequality they say is prevalent in the criminal justice system. The attorneys staged a seven-minute die-in outside the Brooklyn Detention Center shouting "We can't breathe" — Garner's last words. 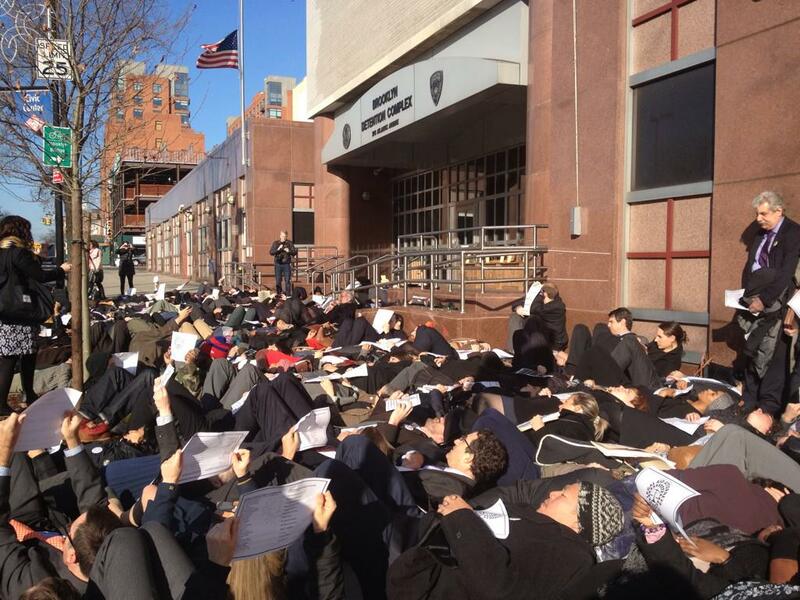 NYC public defenders die-in outside Brooklyn detention center shouting We can&#x27;t breathe. NYC public defenders die-in outside Brooklyn detention center shouting We can't breathe. "Indict, convict, send those killer cops to jail," the lawyers shouted as they continued their march back to the Brooklyn Criminal Court. Leah Maloney, a Legal Aid attorney, told BuzzFeed News that during her daily shift she gets at least one to two clients who have been beaten up by cops without any charges against them. "We want to seize the opportunity to highlight the broken system now that there's public attention and engagement with these issues," Maloney said. "We get clients who are beaten, assaulted, and in some cases, sexually assaulted, by cops every day," Anne Oredeko, a Legal Aid attorney and part of the Attorneys of Color Caucus within the ALAA, told BuzzFeed News. "As attorneys, we are in the belly of the beast," Oredeko said. "We encounter countless people being assaulted by police officers who get off scot-free." "We are experts on the system, and we know the system is broken," Roy Wasserman, a Legal Aid attorney said, adding, "grand juries are rigged." Wasserman said the police don't go to white upper class neighborhoods, but go to poor neighborhoods to keep their numbers (of arrests) up." "Instead of being reprimanded, bad cops get promoted," he said.